Rajnath Singh, a “prominent Indian politician”, according to Wikipedia anyway, has recently asked why the Supreme Court of India handles its cases only in English. “I was surprised when I came to know that the lawyers were allowed to plead the cases in English only in the Supreme Court of India. This practice is applicable in High Courts also. When Hindi and other Indian languages are allowed in Parliament debates, why are they not allowed in the Supreme Court and High Courts in states? Now our first thought was – You know, in Parliament people are also “allowed” to scream and shout insults and jokes. They are “allowed” to walk-out or tear up manifestos. And before the mikes and chairs were bolted to the floor, they were “allowed” to use those in impromptu pitched battles against the opposition. When will the judges start doing that? After all it is “allowed” in Parliament right? But we know what you are thinking – who is Rajnath Singh? We did a little snooping around we were also surprised initially when we found out. Later we were slightly bewildered, finally we ended with a tie between flabbergasted and dumbfound. He was also the President of the Bharatiya Janta Party (with a request like that, what else party could he possibly belong to) AND he was a cabinet Minister in the NDA. And this man does not know why the courts speak the angreezi? He was SURPRISED that they do? We wonder what he was actually doing all those years – other than introducing Vedic mathematics to the syllabus that is. But we must not judge. Just because someone feels he is capable of running one of India’s largest states and was heavily involved in Indian politics for nearly four decades, does not mean he has to actually KNOW anything about this country. So, in the spirit of helpfulness and kindness that we are renowned for, let us try to clarify something for Shri Rajnath Singh in the simplest terms possible. The Courts, especially the Supreme Court, does not run on Hindi because the judges, the lawyers and the plaintiffs do not always come from Uttar Pradesh. Shocking I know, but sadly true. 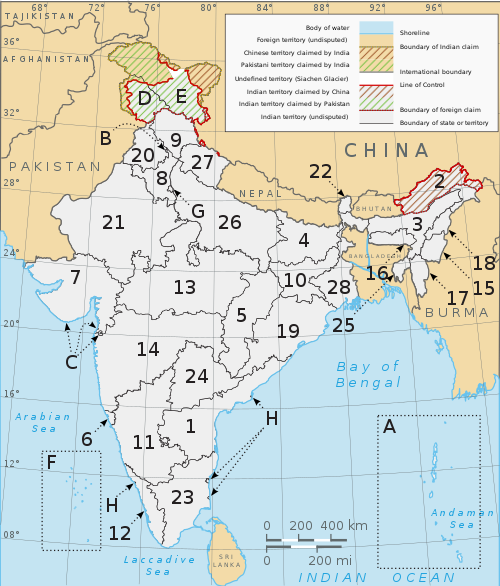 To help those unable to face this fact, or unaware that India is a federation of many languages and cultures, we have provided this image of India, numbering the 28 states and 7 Union territories. Kindly mesmerize yourself with it. We hope this has clarified any lingering or vague doubts Shri Rajnath may retain on the issue.